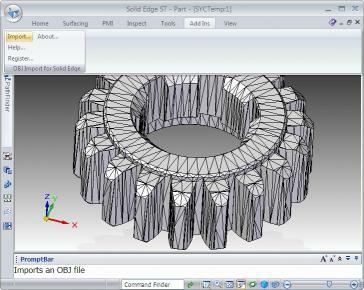 OBJ Import for Solid Edge is a Wavefront (.obj) file import add-in for Solid Edge. This plug-in gives Solid Edge the ability to import geometric data from OBJ files.OBJ Import for Solid Edge reads polygon mesh data stored in OBJ files and imports it into Solid Edge. A polygon mesh in an OBJ file is comprised of a set of triangular andor quad faces. OBJ Import for Solid Edge creates trimmed planar surfaces for each trianglequad and knits them together to create a body. If the polygon mesh is closed (i.e. it does not contain boundary edges) then OBJ Import for Solid Edge will create a closed body feature otherwise an open surface will be created.OBJ Import for Solid Edge is very easy to use. 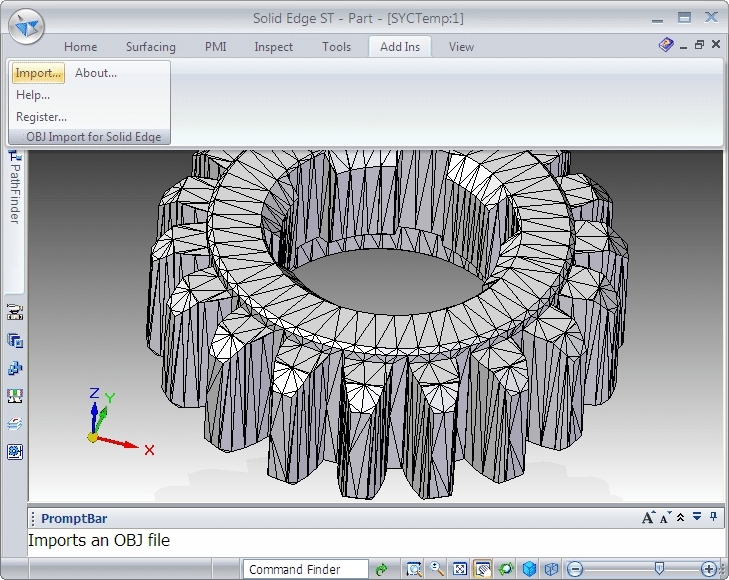 Once installed it automatically loads itself into Solid Edge and adds a new submenu called OBJ Import for Solid Edge to the Solid Edge Applications menu.The OBJ Import for Solid Edge menu consists of the following commands:# Import - Import an OBJ file# Help - Display the OBJ Import for Solid Edge help file# Register - Register your copy of OBJ Import for Solid Edge# About - Display the OBJ Import for Solid Edge About boxOBJ Import for Solid Edge comes with detailed documentation for each command as well as a tutorial to get you started in the shortest possible time.The OBJ File FormatThe OBJ file format is a geometry definition file format first developed by Wavefront Technologies for its Advanced Visualizer animation package. The file format is open and has been adopted by other 3D graphics application vendors making it a universally accepted geometry file format. The OBJ file format is a simple data format that represents 3D geometry alone - namely the position of each vertex the texture coordinate associated with a vertex the normal at each vertex and the faces that make each polygon.